Website Re-design & Integration into WordPress multi-site, including new reservation system integration & all customer touch points. Design process and integration across (3) website properties that matches customer branding and blends the user experience between main website and reservation system across each site. Ability to manage content across all website from a single admin system - including ability to designate roles that only edit a single site or all three. Ability to roll out future website and manage them under this same console. Integration of security plugins and monitoring. Integration of core product templates (tours), variants (add-ons) for all products. Integration of all content pages and pages that support the buying process, policies, etc. Preservation of URL structures and SEO for old site to new. Proper 301 redirects for all urls indexed by Google that cannot be copied. Standardization of content in proper SEO hierarchy. Post-launch monitoring and detection of SEO issues across all sites. Integration of Zozi features into site as outlined by Developer Guide - including assistance with back-end features such as Quickbooks integration and tour package management. Creation of admin-friendly processes and tools for self-managing as many aspects of day to day operations without the need of a developer and designer (where appropriate). We will work with you to create content areas that do not need complicated graphical work to make changes. In short, we want to help code ourselves out of a job. Total mobile responsive framework – we will ensure a consistent experience across tablets/mobile and browser devices. Page / Product SEO, TITLE and meta data for customization on all pages. All customer touch points for communication, order follow-up emails and other contact points. Assist with additional tasks not identified as requested on an hourly basis after site is deployed, set-up and ready for products to be copied/imported by client. Current bid assumes using existing content - but with better message crafting and visual design. Any new content may require additional work - however, we always will discuss this when you send us new content that doesn′t fit the original scope. Terms: 33% deposit to start. Progress billing on Net 15. Client should allow for up to 20% extra in final budget for things you may need additional help with or were unknown at the beginning of the project. This is not required, but a realistic expectation as you work through your project. The current budget reflects the client doing as much of the tour content/product work as possible (if rewrite) or our moving existing tour/product content over to new Zozi system. Timeline – Sites like this average around 120 days of design & development time - with content changes often being the portion of the project that can take the most time if you are writing/editing new content. We can use existing content and but a better "polish" on it to help speed the project up. * - any third-party stock photos may require a one-time license fee, typically $5 - $7 per photo credit – client may choose photos or provide existing images as needed. The following is a description of our methodology for developing projects and executing the services we sell to our clients as well as the communication channels used to ensure clear, effective communication at every level. Creation of Work Plan & Clarification of Project Goals by FDG Web staff. To understand the business case and needs behind the individual specifications listed, we must return to our clients a work plan. The work plan is not merely a reiteration of the specifications, rather it is the mapping of the proposed solutions and how they will meet the clients goals for each phase of development. The Software Framework, System, Software or other solution(s) implemented to meet the client′s particular needs. The modifications & custom programming to be made in order to meet the client′s needs. The step-by-step work flow for each custom, “non-housekeeping” function included in the solution(s). The determination of the project area(s) and what version controls will exist. The areas that are considered to be "Discovery" by either the client or FDG (or both) and the work flow for guiding everyone through the Discovery Phase for features, process and functionality. The "content plan" which details what assets will be provided, who is responsible for integration of content and in what format it is to be received in. The content plan may have several different processes based on the client′s needs and the functionality of the website. Who the project manager and staff responsible for the work plan are and their contact information. Where the project will exists in our Project Management system and how easy it is for the client to interact with it from their browser or mobile device. What the testing plan will be and why we use the "Exploratory Testing Method" as opposed to manual scripted testing approach. An outline of the expected times in which meetings or presentation of deliverable will occur and what decision-trees may need to exist. It is important to make sure that the client understands when a critical decision point is going to be reached for an individual function, feature or development milestone. The Work Plan helps outline these things in a more natural language. Upon submission to the client, the client will sign off on the plan or suggest revisions. The sign-off can occur as a unilateral agreement via email or fax, but just not phone. Depending on the overall schedule and specifications, we will have a creative cycle that includes the creation of one or more flat mock-ups (JPG/PDF) that acts as an initial wireframe for the design process. Upon completion of this process, we will have a viable wireframe and walk through of all primary pages and features of the website and the client will sign-off on the concept and design framework. The sign-off can again occur as a unilateral agreement from the stakeholders via email or fax, but just not phone. Development occurs concurrently in most cases, with the design team working on the HTML/CSS templates for all pages, views, modules and features of the website – while the development team begins building the database schema, framework and installation(s) that occur prior to design integration. Each team as a Lead and that lead is the main point of contact for the work being performed. The Lead or the Project Manager may be in contact with the client directly, however it is the PM′s responsibility to manage and organize all contacts so there is no confusing on who is responsible for what tasks. Leads may talk directly to the client in order to get information and direction. All communications via email get logged into the Project Management System. If a phone call results in a decision or action(s) to be taken – the Lead is responsible for recapping or summarizing what was decided and posting it to the Project management System. This is an easy to take step that allows a summary of what was discussed to be quickly verified with the client. Complete testing of deliverable(s) across all target browsers. Complete testing of all alternate content across all target devices. Load & stress tests for all target hardware. Client has a release checklist and who to contact with edits, changes, updates or bug fixes upon release. Client understands what information they should try to ask for from users who report problems or bugs in the system. Release is ready when the client has signed-off on the deliverable(s) and functionality as demonstrated. Release adheres to its own schedule depending on the needs of the client. In the case where a project is migrating to a new server, and will involve a DNS switch – we must ensure that the client and their staff understand what that will entail and how best to handle any trouble typically associated with DNS propagation. In the case where an internal DNS switch is made, the client will advise us as to what systems will be impacted and to what degree. Regardless if it is a new site, replacing an older site or a hybrid … both the client and FDG Web will agree upon a release schedule and when the system should not be used until the release is complete. In the case of ecommerce deployments we will typically have a synch of customer and order data prior to the release – then synch again after the release is completed. In the case where a website, intranet or application can been build on an existing domain, we will synch any production data (if applicable) backup the BETA build, backup production again and roll the BETA into the root of the website. As soon as the new site/project is live, we will rebuild the Google XML site map, verify and resubmit it again to get the site indexed correctly. Mod_Rewrite for friendly urls is functioning correctly. All forms submit and connect to their mail servers. All robots.txt, exclusion files or other items designed to hide the website has been removed where applicable. All 300/301 redirects have been put in place to redirect traffic from non-functioning urls to their new equivalents. A catch-all redirect is put in place for all other 404 errors, etc. All debuggers used have been switched to IP-only so no errors are displayed to users. All other items identified in the project′s launch list, as developed internally on http://launchlist.net/ are tested again. troubleshooting that may be required. The project manager may begin to receive change requests or bug fixes from client. Requests may also begin to come into Leads depending on the area of responsibility and who is making the request. All bugs are logged and tested. All updates are made in a timely manner. All requests which appear to be feature-requests are logged and discussed with the Project Manager who can formulate a business case or explanation to the client. Many clients will just forward user feedback directly to FDG Web staff .. which is valuable in the case of bugs, user issues, etc, however, suggestions or features to be added should first be presented to the client prior to engaging any further development. Users should not be modifying the clients specification upon release is the issue we would be trying to filter out of post-release troubleshooting. Post-release we will have refreshed the BETA area and all development, bug fixes or additions are added here prior to promoting it to production. Post-release we will have scheduled a time to discuss with the client any post-release issues or unfinished features, or third-party integration that may still need to be implemented Maintenance shall be performed according to the schedule outlined prior to release. Post-release evaluation shall be organized and executed in conjunction with the clients desires by the FDG Web project manager. While we have formal surveys we can submit to the client, often the client doesn′t want any extra homework or obligations at this phase. In this situation we will discuss the satisfaction of the project with the client in-person or over the phone and publish the notes internally for additional feedback and/or action. "DDP YOGA has been using FDG for years and for good reason. Their professionalism and skill is unmatched. No matter what challenge we′ve thrown at them they always come through. I couldn′t recommend them more." 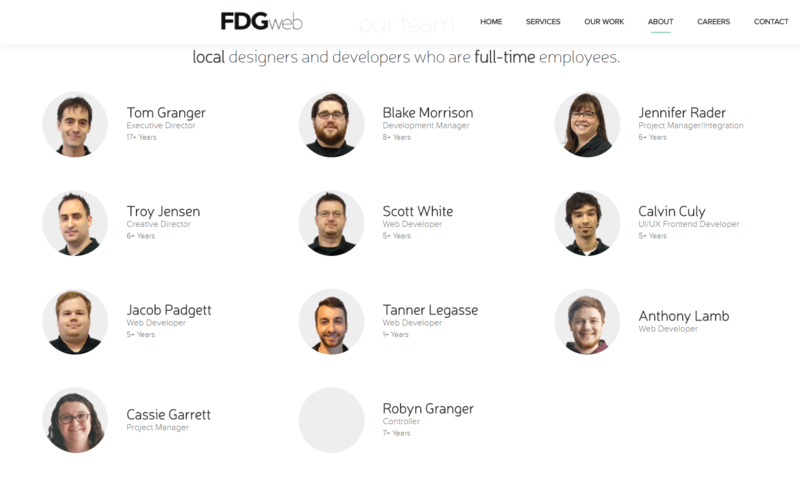 "FDG Web was fantastic in taking our vision and making it into a website. We could not be more pleased of the work that they did for us and look forward to our next project together." "FDG Web exceeded our expectations when they upgraded our website from Joomla to WordPress. Their technical programmers are savvy with the latest technologies and easy to work with. Thanks to FDG Web we were able to get our new website hosted in only a few months." "I have worked with Tom′s team on many separate occasions through the years and have never hesitated to recommend FDG Web to others. He is personable, knowledgeable, professional and a consummate entrepreneur. He runs his business in an honest and straightforward manner that is both refreshing and inspiring."